Are You in the Market for a New Boiler? Are your boiler and/or radiators creaking and squeaking? Or do you find that your boiler is not heating your home evenly, the way it used to? Maybe it seems to be working harder than ever, but ... brrr ... producing less and less heat. Any of these could well be a sign that the time has come to replace your boiler. In general, home heating boilers are hardworking appliances with an expected lifespan of 15-20 years; however, they do wear out eventually. The good news is that the boilers of today have become ever more energy efficient; if you're in the market for a new boiler, the installation cost will be largely offset by the potential savings on your utility bills. A hydronic boiler is part of a central heating system that works by warming (although not necessarily "boiling") water, which is then circulated via wall radiators, baseboard heaters, or in-floor plastic piping, to heat your home. This type of heating system is less bulky and more energy-efficient than the popular forced air furnaces. In fact, the boilers of 2015 are also a great deal more energy-efficient than their counterparts in the past, even compared to a version manufactured as recently as 10 years ago. The result is that the cost of replacing your boiler will be at least partially counterbalanced by the new appliance's lower fuel consumption. When you are out to purchase a new boiler, look for the Energy Star certification. This will ensure that your boiler has an annual fuel utilization efficiency (AFUE) rating of 85 percent or more -- that is, at least 6 percent better than a standard non-certified model. 1) They are ignited by electricity instead relying on a pilot light, which must be burning -- that is, consuming fuel -- constantly. 2) Advanced combustion technology means that more heat can be extracted from a given amount of fuel than previously, resulting in a lowered carbon footprint. 3) The sealed combustion system means that the boiler's burner is fueled by outside (rather than indoor) air, reducing the possibility of hazardous carbon monoxide (CO) emissions into your home. 4) Condensing boilers preheat the cold water which is about to enter the boiler, using waste heat. This makes them the most efficient type of boiler developed to date. You'll have a choice of home heating boiler systems which are powered by a variety of fuels. The most common fuels used are natural gas, oil, propane, and electric. 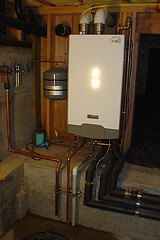 A natural gas boiler will generally be the cheapest to run, but you must have either a gas line that is already in place or the capability to connect to the local service. Due to the relatively high cost of electricity, operation of an electric boiler will tend to entail the most expense. The cost to install a boiler is related to the heating capacity size that you need, which in turn depends on the number of household members and the physical size of your home, and whether you opt for a condensing model or one that includes a water heater function. Other factors that will affect the amount you have to spend may include repair or replacement of your current ductwork, setup of the necessary pipes and radiators, the cost of removing your old boiler or other type of furnace, and your location and climate.